It's a marriage between the raucous Ati-atihan Festival of Kalibo, Aklan and the St John the Baptist themed Basaan Fiesta of San Juan and the Parada ng Lechon of Balayan, Batangas where the people of Paete, Laguna, for more than a century, parade on the streets with the Sto. 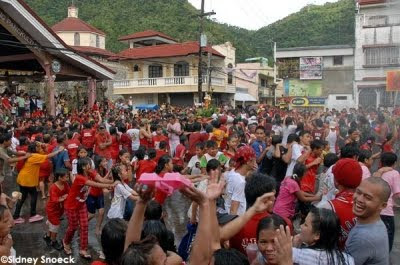 Niño (child Jesus), while spectators and revelers alike splash water on one another. These days, you can now see the same festival celebrated in neighboring towns of Pakil, Pangil, Kalayaan, Lumban and Pagsanjan but the original is always Paete, the first to have the unique Sto. Niño fiesta in the Philippines. When did the Salibanda start? Who started it? Did it begin as an animist/pagan practice and converted into a Catholic tradition similar to the Ati-atihan Festival? 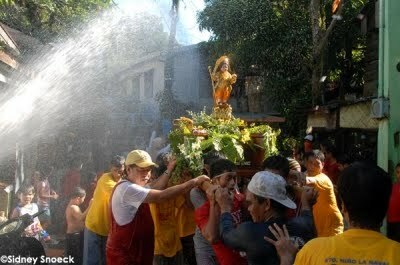 No one definitely knows for sure when or when the "wet and wild" devotion to the Sto Niño began and originated. Local lore and legends are also hard to believe. No scholarly study has been done to trace and document this. There's only documentation that the practice was present in the late 19th century and the original Sto. Niño image was transferred from the Catholic Church to the Aglipayan in 1902 when the original owners of the image switched religion. in history there's a saying: "no document, no history" the mystery behind this tradition still exists waiting for a scholar to dig deeper or someone to stumble upon an ancient document (a 19th century or earlier blogger perhaps?) detailing it's origins and original intent. Kudos tutubi for a very informative blog. About the history of SALIBANDA po, I received some leaflets that states theory that will defend the stand that the SALIBANDA is really from the Roman Catholic Church. I also scan history books of PAETE, and I saw a paragraph stating that SALIBANDA WAS ORIGINALLY A CATHOLIC TRADITION BUT TRANSFERRED TO THE IFI due to Religion Conversion. I just want to share this one! Thanks! :D Preparing for HOLY WEEK na po tayo, haha. Hope that you will have photos too.